​the cozy three-bedroom cottage and adjoining retreat center are perfect for exploring Charlottesville and the surrounding area. Cottage amenities include a full kitchen, 3 bedrooms, 1 bath, laundry facilities, wifi, satellite tv, pool access (in season), an outdoor fire pit, picnic tables, ​a fishing pond, private hiking trails, beautiful vistas and ​an abundance of fresh mountain air. TERMS AND CONDITIONS: By clicking on the Donate button below, you affirm that you are over 30 years of age and agree to abide by the rules and regulations herein. Payment for a reservation in part or in whole constitutes an agreement to rent the facilities on the requested date(s) under the terms and conditions listed below. The Renter agrees to pay all amounts due. Cancellation of the reservation at least fourteen (14) days prior to start of rental period will receive a full refund. Cancellation less than fourteen days prior to the start of the rental period will incur a 25% rebooking charge, and cancellation less than seven (7) days prior to the start of the rental period will incur a 50% rebooking charge. If Dover-Foxcroft becomes unavailable due to power outages, natural disasters or other Acts of God, Spring Hill Foundation will refund all amounts received from the Renter, and the Renter’s rights and remedies shall be limited to such refund. The Renter agrees to maintain supervision or appoint another adult over the age of 30 to maintain supervision of guests throughout the entirety of the rental period. The Renter is responsible for any and all damage done to the facilities or property by the Renter or any person who is a guest of the Renter on the date(s) of use. If damage occurs to the Dover-Foxcroft facility, property or grounds, the Renter agrees to immediately inform Spring Hill Foundation of such damage and agrees to pay all amounts invoiced for damages within 10 days. The Retreat Center is for day use only and is not to be used for overnight accommodation. The cottage is for overnight accommodation and is limited to a maximum of seven (7) overnight guests. 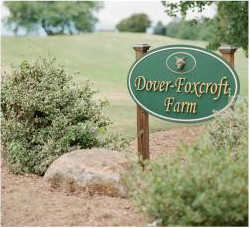 The Renter agrees to clean up after his or her event at Dover-Foxcroft is completed and will return the facilities and grounds to the state of cleanliness and orderliness provided at the beginning of the Renter's reservation period. Trash bags are available to facilitate cleanup and may be deposited inside the dumpster located on the property. Vehicles are to park and drive only on gravel paths and lots or specifically designated parking areas beside the gravel lot. Driving vehicles across fields, lawns and meadows is strictly forbidden. Failure to remove all trash, personal belongings, decorations or messes in the buildings or on the grounds constitutes a breach of this agreement and Spring Hill Foundation retains the right of refusal for any future reservations with the Renter and the Renter's guests. The Renter agrees to promptly clean up pet waste both inside and outside the buildings (bags are available in the cottage). Pets are absolutely not allowed in the pool or inside the enclosed pool area. Glass is not permitted inside the enclosed pool area. Children under age 13 and non-swimmers of any age are to be under adult supervision at all times in the enclosed pool area. Open flames, other than inside the designated fire ring, are not permitted on the property. Fireworks or pyrotechnics of any sort are not permitted on the property. Illicit substances and related paraphernalia are not permitted on the property. The Renter agrees to not provide alcohol to anyone under the age of 21. Spring Hill Foundation is not responsible or liable for injuries or incapacity of the Renter or the Renter's guests, nor any lost, damaged or stolen property. While on the Dover-Foxcroft property, the Renter agrees to not conduct, allow or participate in any dangerous, illegal or risky behavior nor engage in any other activities that violate any legal statute or that a reasonable person would consider as having an above-average risk of injury to any person. The Renter agrees to indemnify and hold Spring Hill Foundation harmless for any accident, incapacitation, offense or injury to the Renter or any of the Renter’s guests during the Renter’s use of any part of the Dover-Foxcroft property and facilities. The Renter is responsible for any medical or accident insurance for the Renter and the Renter’s guests. The Renter will abide by the Albemarle County noise ordinance and respect the local residents and will enforce cessation of all music, yelling, screaming or other loud noises originating on the property as of 9:00 p.m. No smoking is allowed inside any building on the property. Spring Hill Foundation retains the right to monitor or observe any event taking place on the Dover-Foxcroft property. The Renter will inform the Renter’s guests of these rules. Clicking on the Donate button is a commitment to abide by all of the Terms and Conditions set forth above. Please take a moment to read through these rules and regulations prior to making your reservation. If you have any questions please email us at dover5690@gmail.com.